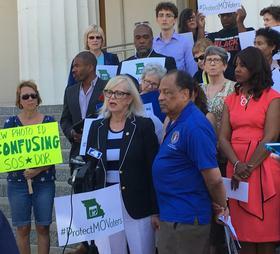 Denise Lieberman, with the civil rights group Advancement Project, on Wednesday speaks at a news conference at the Old Courthouse about Missouri's voter ID law. Missouri residents voted in November to allow legislators to institute the voter identification requirements, and the Republican-controlled legislature did just that. With the law’s implementation Thursday, Missouri joins 33 states, many with Republican legislatures and governors, with a form of voter ID laws touted as an effort to prevent voter fraud. 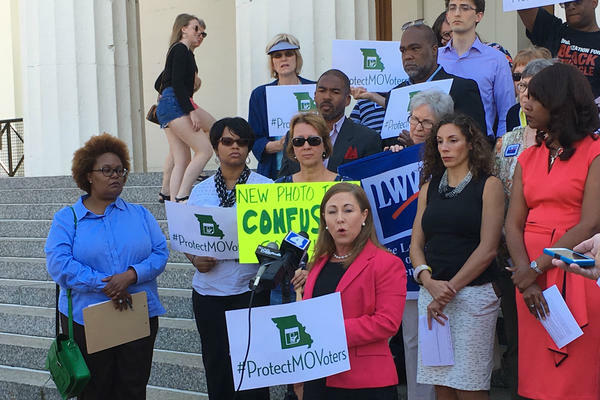 With the Old Courthouse in downtown St. Louis as the backdrop, Denise Lieberman, the senior attorney for the Advancement Project’s voter protection program, decried the law, saying it will disproportionately affect minorities, older people and people with disabilities. “Even if this works perfectly well as planned, even if this works under the best-case scenario, what you will have are two-tiered voting. You will have some people who can go to the polls, show an ID and cast a ballot, no problem, and other people who are relegated to a second and inferior voting process, where they have to present additional documentation, they have to sign a statement under penalty of perjury, they are subject to additional scrutiny,” she said. “That is a separate and unequal system. Cast a provisional ballot that will be verified by a matching signature on the voter registry or coming back that day with a valid photo ID. Not all of the voter ID laws in the United States are created equal. Texas’ 2011 law, which was widely viewed as one of the strictest in the nation, was struck down in April by a federal judge who ruled it was intended to discriminate against minorities; Gov. Greg Abbott signed a revised law Thursday. The U.S. Supreme Court recently declined to hear an appeal of North Carolina’s voter ID, which a federal appeals court struck down as unconstitutional. About 300,000 voters in Wisconsin did not have the proper IDs in the November election, according to an Associated Press report, which Lieberman cited Wednesday. However, it wasn’t clear how many people in Wisconsin did not vote. Ashcroft also rejected claims that 220,000 people in Missouri will be affected by the law. He said that figure, used by Democratic Rep. Stacey Newman of University City, was based on a count that didn’t take into account cleaned-up voter rolls or other types of acceptable IDs. He estimated that it’s more likely between 100,000 and 130,000 people would lack the proper documents to vote, but he didn’t have an exact number, saying the statement people have to sign if they show up with an approved document but not a photo ID will help determining a better figure. Newman, who serves on the House Elections Committee, said one of the main issues is the vital records needed to obtain a photo ID — such as a certified birth certificate, marriage license, adoption papers or an amended birth certificate. Ashcroft’s office says it will help people obtain those documents for free. Newman argued that it’s not always that easy. “We’ve got a [transgender] community that it’s not easy for them to get their birth certificates altered, and again, if your documents don’t even exist, it doesn’t matter how much money there is, or if the state promising to pay for it,” she said. But Democratic Sen. Jamilah Nasheed of St. Louis said that the law is underfunded by $3.5 million, something Democratic Rep. Joe Adams of University City, who is a member of the House Elections Committee, also addressed. But Ashcroft said those were based on the prior administration’s numbers, which sought funding for more than two years, not one year. This is Missouri’s second attempt at having voters show an ID at the polls; the first was struck down as unconstitutional by the state Supreme Court in 2006. The state has a website that explains the law and outlines the necessary documents. Are Communities Of Color Being Heard In Missouri's Capitol? 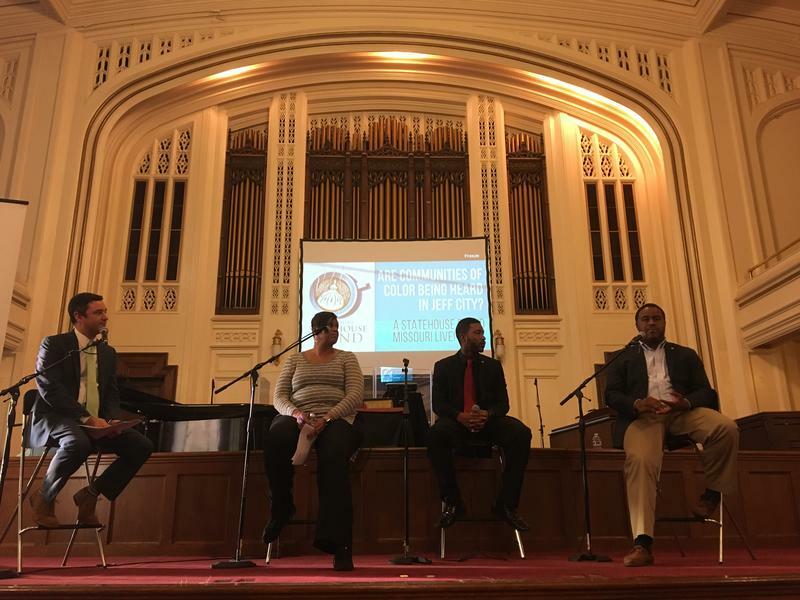 At the end of the 2017 legislative session, we took the podcast on the road to ask an important question: are Kansas City's communities of color being heard in Jefferson City? This podcast was recorded live at the Metropolitan Missionary Baptist Church in Kansas City, Missouri. Missouri Gov. 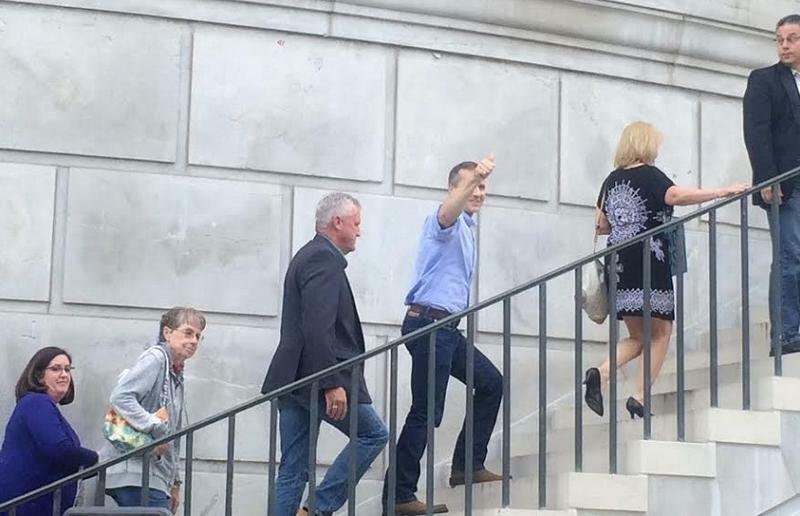 Eric Greitens’ first special session was a success. On Friday, the Senate passed a bill 24-5 designed to reopen an aluminum smelting plant once operated by Noranda, as well as to build a new steel plant nearby. The bill will take effect the moment the Republican governor signs it. 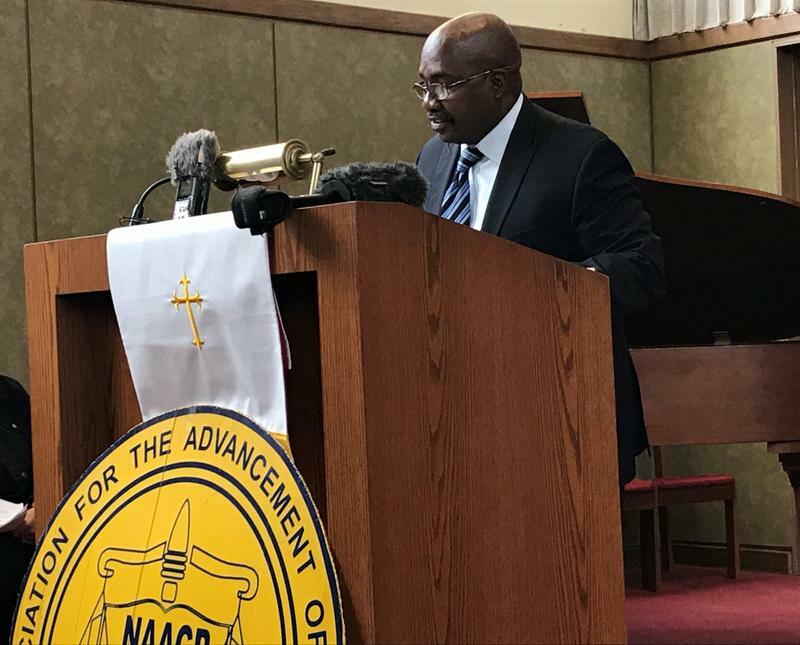 The president of the Kansas City, Missouri, chapter of the NAACP told reporters and members of the community Tuesday that there was an “ugly urgency" to call on Governor Eric Greitens to veto Senate Bill 43. The bill weakens protection for minorities and women, Rev. Rodney Williams said, by making it harder to prove discrimination is the cause of an employer’s disciplinary behavior. 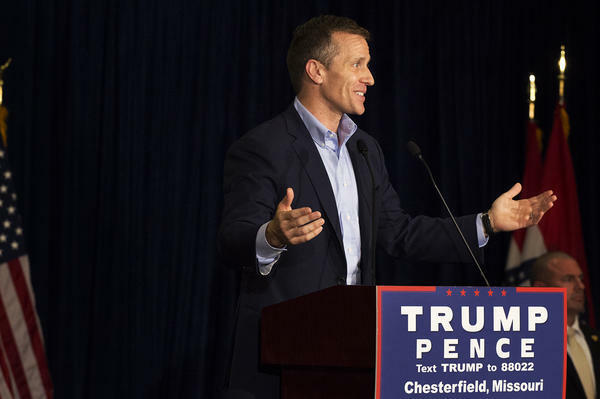 The Missouri General Assembly’s first special session during Eric Greitens' governorship has come and gone, but the state's chief executive has signaled that more legislative overtime could be on the way. Today, we discuss that might mean for Missouri's part-time lawmakers.